Oh James! is amazing!, I can't wait for this book! Congratulations, and we count the days for august. MORE?!! This is fantastic news! The Maze Runner has to be my FAVORITE book ever. I was so sad when I thought the series was over!! Thank you so much, James! How very exciting! Can't wait to read it. Wow!! Such awesome news! Huge congrats! Ooooh. Very fun! I just finished the Death Cure (still need to write up my review over on my blog, but I loved it). I love the idea of stepping back to see more of the details of what brought us to the Maze...really looking forward to this! OH MY GOSH! I had no idea this was coming. I cannot wait to read this. My bloggers and students are going to be thrilled! Wow! This is so cool! Bring on August 2012. Oh my gosh I can't believe this is happening! This just made my day!!! :0) You're sooo awesome, James Dashner!!! oh.wow thats amazing have an idea what you can make for another book.tell me if you want to hear it. I'm guessing this won't have a happy ending? I can't wait for this book!! More to look forward to! Congrats, James! That is so cool, James! Congrats!! Yay!! You mentioned this at your book signing and I have been dying for you to formally announce it!! I am soooooooooooo excited!!!!!!!!!!!!!!!!!!!!! This is GREAT news!!!! I just told my 9 year old and he is as excited as I am!!! Thank you, thank you! Such great and awesome news!!! I've gotten so many kids hooked on this series right now :) They'll love this news. 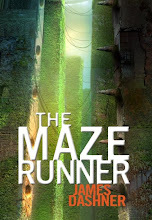 My grandson lent me The Maze Runner. He'd gotten it for his birthday, liked it very much, and knew that I would, too. Indeed, I enjoyed it so much that, after finishing it, I went to Amazon to buy Kindle versions of the next two books for my grandson and me...only to discover that they were $9.99 and $10.99. Sorry, but I refuse to spend that much on an electronic book. Heck, I won't even spend that much on a paperback! Not to mention that Amazon is selling new and used copies that, even with shipping, are less than the electronic versions!!! But the fact is that there is so much entertaining reading out there available for ebook readers costing *far* less than $10-$11 each that, much as we'd have preferred to keep reading, both my grandson and I will soon forget The Maze Runner series as we discover other delights. So would you please beat Random House with a stick for us??? Thanks!! That's really cool.Thanks for sharing this post. Is this why the death cure answered, like 1/5 of the questions it was supposed to? I was seriously disappointed in that one. I'll be sure to blog about this later. This is my favorite series ever, and I have read hundreds of book. From horror, science fiction, to realistic fiction. The plot of this book is just so amazing. I loved The Death Cure, but I thought there was something missing in the series. I think this will be that thing that was missing and now I am tremendously excited. Thank you so much James Dashner. The Maze runner is definitely a must read. I have enjoyed reading this book from start to finish. I JUST DIED.... OF EXCITTEMENT! EPIC!!!!!! The Maze Runner Series is my new favorite series. this is awsome!!!!!!!!!!!!!!!!!!!!!!!!!!!!!!! !i love his books they so exiting and i can never ever stop reading them. keep writing dashner! Not being a party pooper, but I'm kinda disappointed after knowing that there's going to be a whole new cast of characters, and that we probably won't ever get to know Thomas' history. But, I'm confident in your writing skills, and I know the prequel will be awesome when it's published. Yay!!!!!!!! All the time during the death cure i was literally yelling at thomas to go get the swipe cleared so we could find out what really went down. I do hope that it will include something about thomas and teresa working for WICKED. holy cow! And just when I thought the awesomeness was over! I really hope you'll do a contest to win a signed one early!(please,please,please! )Can't wait! PSYCHED!!! Me and my best friend are completely obsessed with this series and it's the only thing we talk about when we are together. We got depressed when we finished reading the Death Cure. Now I'm soooooooooooooooo happy that a new book is coming out and I can't wait to tell her. Thank you so much!!!!!! Definitely one of the best YA series ever. Ahh! om my gosh! i seriously can't wait!! hey you need to allow your books to be published on a kindle i have heaps of friends who love your first book cause it was in the libray but we all have a kindle and wana buy the others PLEASE!!! Dude, are you serious? You're complaining about $10-11? I bought The trilogy for at least $20, and I sure as hell don't regret it. Sure, the ending to The Death Cure made me wish I'd never bought it, but they're all definitely worth a measly $10. Stop being such a tight-arse and buy them, especially if you can afford an electronic reader.